The suffragette smashed a window at Dublin Castle in 1912. YESTERDAY, A WOMAN broke a window at Dublin Castle. She was arrested – but by a fake officer. That’s because the woman was Micheline Sheehy Skeffington, the granddaughter of one of Ireland’s most prominent feminists, Hanna Sheehy Skeffington. She was reenacting the actions of her grandmother in 1912, when as part of the militant suffragette fight for the women’s vote, Hanna broke a window at Dublin Castle. It took another six years before women were given the vote in the UK and Ireland. Looking at that time over 100 years later, Micheline says that she believes Hanna would be “quite surprised at how long [equality has] taken” in Ireland. “I think she would be quite scathing of people giving lip service and [how] now we’re starting to talk about bringing in a quota for 30% of [political candidates to be women],” she says. I think Hanna and my grandfather Frank would have been quite dismayed at just how slow it’s been. Yes, we’ve had two wonderful female presidents and there are some good leaders there but it’s not a lot at all at the moment. “So yes, I think they’d be happy to see independence; to see women more independent in their lives, but until you do away with violence against women, until women are able to walk the streets [without fear] and feel safe in their homes, we haven’t got equality, we can’t see the world in the same way,” says Micheline. 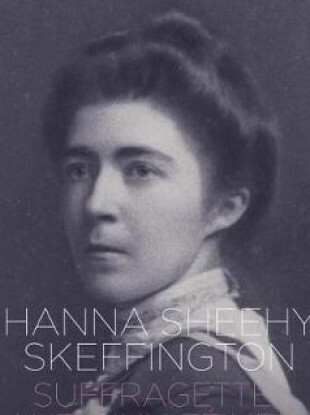 Hanna Sheehy Skeffington was born on 24 May 1877 in Kanturk in Co Cork. She grew up in Tipperary from the age of three, and the family moved to Dublin when she was 10, after her father became an MP. Hanna was unusual for that time in that she attended university, and went on to keep some interesting company – her brother was friends with James Joyce, and the family were written about in Ulysses. As an adult, Hanna worked as a teacher. She met Francis (Frank) Skeffington through his university friend Joyce, and the couple married in 1903. They took each other’s names as a mark of honour and respect. Being born into a republican family, Hanna was always bound to be a person who lived her political ideals. She and her husband founded the Irish Women’s Franchise League alongside Margaret Cousins in 1908, a suffragette group that fought for women’s votes. They also founded the Irish Citizen newspaper, which was a space to explore their ideals. Historian and biographer of Sheehy Skeffington, Margaret Ward, says of Hanna: ”She came from a very political background in terms of the Land League and tenants’ rights, she had a father and brother who went to prison several times; she came from a family of activists.” As a child, she helped her aunt to deliver food to prisoners in Kilmainham Jail. Anna and Thomas Haslam had already formed their suffrage association, but Hanna founded the Irish Women’s Franchise League in 1908 with her husband and Margaret Cousins. The IWFL offered a different approach to previous groups. “There was a long campaign of petitions and drawingroom meetings and all of those kind of things, but they felt the pace of change was too slow and they didn’t feel that parliamentary vote was going to happen that easily,” says Ward of their motivation to move towards a more militant focus. The IWFL was not just linked to suffrage, but also to nationalism, and reflected how Hanna and Cousins were both university graduates from middle-class Catholic and Protestant backgrounds, says Ward. The differences between the groups become more acute in 1912 when the IWFL “finally embarks on militancy”, says Ward. “The poitical atmosphere becomes really quite frenzied by 1910 onwards,” she adds. When it became clear that women’s suffrage wasn’t going to be included in the Home Rule Bill, things stepped up a gear. In 1913, Hanna was fired from her job as a teacher due to her militant activity. “They talk about the cause as being this camaraderie, the spirit of sacrifice,” says Ward of the Irish militant suffragettes. [Hanna] says for the first time women are doing something for their own cause, not for the cause of men. They have this real missionary zeal about it – they are real pioneers of all this. They were really challenging the notions of what was appropriate for women. In 1912, the British Prime Minister Herbert Asquith visited Dublin – and members of the Women’s Social and Political Union threw a hatchet at his carriage. This was just one of the major direct action incidents involving British suffragettes. It becomes hard for suffragettes to hold meetings in public, and Ward says that the Irish public become hostile at this time towards the women. By 1913, women have been barred from attending all mass meetings and all political meetings – even Frank Sheehy Skeffington was banned, so he went into one meeting dressed as a clergymen. “It becomes very difficult for them to do the kind of things they were doing because the politicians won’t meet them anymore,” says Ward. In 1916, tragedy strikes the Sheehy Skeffingtons. Both Hanna and Frank supported the Rising – the ideals if not the method, as they were pacifists. Frank was particularly concerned about the looting, which he felt took away from the idealism of the insurgents, says Ward. Hanna volunteers at the GPO during the Rising. But her husband is arrested while handing out leaflets on Portobello Bridge (the leaflets were to discourage people from looting) and is later shot at Portobello Barracks. A commission of inquiry took place into Frank’s death, and Hanna also met with the Prime Minister over the incident. Hanna gets a false passport and effectively smuggles herself over to the USA, where she stays for 18 months sharing her story with audiences in venues as big as Carnegie Hall. “Hanna was an experienced public speaker and an experienced lobbyist and propagandist at this time,” says Ward. She even published a pamphlet, titled ‘British imperialism as I have known it’ which explored what happened to her husband. “She got to see President Wilson so I think it’s a mark of her status that the president agreed to see her,” says Ward of that time. Hanna Sheehy Skeffington is one of the more recognisable names in the fight for Irish suffrage, but her biographer hopes that more attention is given to her achievements. Now that a plaque has been placed at Dublin Castle to mark her militant actions there, it’s perhaps a sign that Hanna Sheehy Skeffington’s legacy is reaching a new level in Ireland. “She has to be looked at in the round, that her political career wasn’t simply as a suffrage militant but it was somebody who – she was a member of Dublin City Council, she was in local government for a long time, but when the Free State really formed she wasn’t a person who fitted in easily at all, she was on the sidelines for a long time,” says Ward. Thanks to the fact that Hanna kept all of her documents, we have a great picture of what her life and career was like. “She’s left us with a fantastic legacy of what Irish women have done through more than half a century,” says Ward. Margaret Ward’s book Hanna Sheehy Skeffington is out now. Email “Fighting for equality: The life of Hanna Sheehy Skeffington”. Feedback on “Fighting for equality: The life of Hanna Sheehy Skeffington”.